The example server for OpenStage XML Applications is currently out of service!. 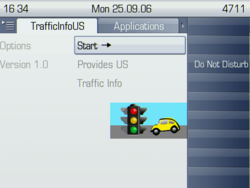 Here you find information about example XML Applications to use on your OpenStage 60/80. These applications are hosted on a web server, and thus can be run straight away by any OpenStage 60/80 with internet access. For instructions on setting up an XML application, see the How to set up an OpenStage XML Application. 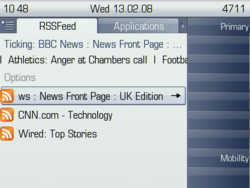 RSS Feed Reader for OpenStage 60/80. Weather report and forecast for OpenStage 60/80. Traffic information for OpenStage 60/80. 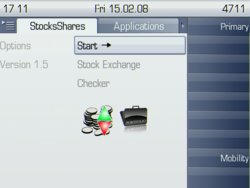 View current stock and shares information on the OpenStage 60/80. 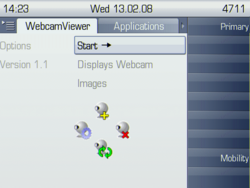 View images from a choice of webcams and combine them as a slideshow, if desired. Multiple Choice Quizzes that can be created via a web portal. This page was last edited on 17 October 2014, at 08:00.